The first row of an afghan with homespun or bouclé or other knobby style yarn can be frustrating. This afghan does not require finding chain stitches, even for the first row. Every side has a fun and pretty zig-zag shape. The example is made in Jo-Ann Sensations Rainbow Bouclé. 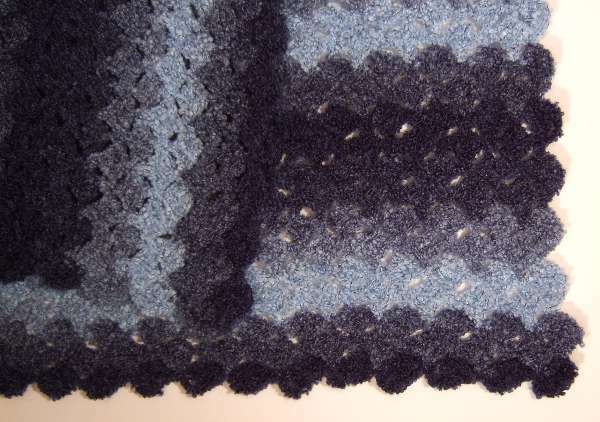 Instead of a beginning chain, the blanket is begun with a first row of blocks. CathyNoyb provided this chart she created in AutoSketch. She created this chart to more clearly demonstrate the transition from the first row to the second row. 6/9/2018 – Added CathyNoyb chart. I crochet prayer shawls and quite often use Homespun. You’re right about the starting chain. I’ll try this. I did a sample with worsted and it worked great. It would also make a nice scarf. Typically when completing a row of crochet, you flip your work from side to side to start the next row. One this blanket, between the first and second row, you won’t flip it front to back, but that is the only time. After that, you will flip it as usual between rows. Please explain what you mean by rotate without turning. How can you rotate the piece without turning it. Maybe a video? Love the stitch, and would like to use it as a scrap buster afghan. Turn in crochet means to flip front to back. I was trying to make the distinction that for doing the second row you aren’t flipping front to back but actually rotating top to bottom. The same side will be facing you to complete the second row, you will just be working across what was the bottom of the first row. My mom had a gahn like this in her stash but she passed before I could get the pattern. Thank You so very much for the share. I’m trying to picture this in my mind.. does it work the same as a log cabin afghan? Just going round and round, working from the center and ending at the outside edges? I looked at your pictorial on how to do the blocks, and going round and round is how to make the log cabin afghan, just adding to the outside rows until it’s big enough. I’m not seeing how you can ‘not turn’ during the construction of this pattern it unless that is the method. If you look at my Ravelry Page (Glacy1) you can see what I am talking about. I like this finished look in crochet, and would like to make one, as I have bins of Lion Brand Homespun to ‘stash bust’..
P.S. I love many of your patterns. They are very creative. It is only after the first foundation row that you rotate instead of turn and do the second row. After the second row you will turn to do the third row as usual for the rest of the afghan. So it’s not going in the round or getting any wider. After the second row it works like any other back and forth afghan. I keep looking at it, and I can only deduct that it will get ‘wider’ as it gets longer.. Am I right? That’s what I’m thinking, too. If you do the sc,ch3,3dc in each loop across, (including the last loop), you add one more 3dc group each row, so I imagine you have to only do a sc in the last loop of each row to make it even. Is that correct? 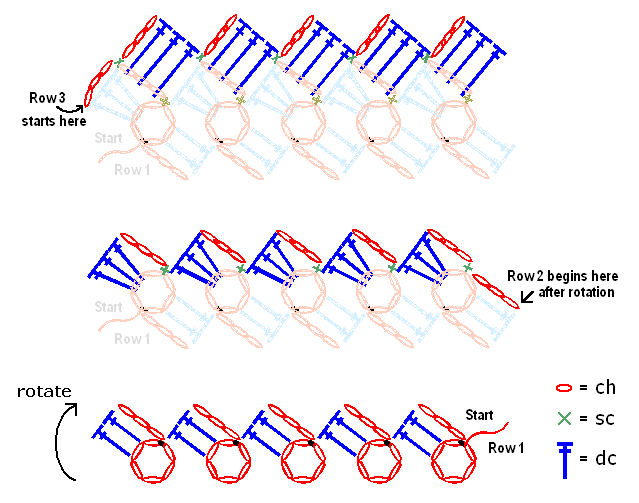 It shouldn’t grow, unless you are calling the last loop of each row the chain that was made at the beginning of the row before the first chain of that row. That is a transitional chain and doesn’t line up with all the rest of the loops of the row – it is on the side of the blanket. Discounting that chain, there are the same number of chain loops as blocks on each row, and the number stays consistent from row to row. You are so right. AND, I want to THANK YOU for solving a problem that at plagued me for years, and that’s crocheting with boucle and Homespun. I avoid them at all costs because of the difficulty in seeing stitches, but not anymore! I can knit just fine with them, but crocheting is a pain. You solved that problem! I absolutely love your patterns and I hope you’ll post more as you can. I’m wondering if this No Beginning Chain method can be adapted to most patterns. Probably not all, but most, I imagine. I love the Asymmetrical shell and the Quick Shell, along with this one. I am sharing your blog page with all my crochet friends here in Atlanta. I’m a member of two crochet groups, and your techniques will certainly be welcome to our group. We LOVE making afghans. My church groups makes prayer shawls and baby items for charity. Thank you so much for all the hard work you’ve done! Thank you so much for writing. I was afraid I had worn everyone out with the No Beginning Chain afghans, so had taken a break from them. You have encouraged me to keep posting them. I actually have one already made, but just haven’t put it together to post. You are right that many stitch patterns can be modified for this method. I look for traditional stitch patterns that are lace, shell or block type patterns where all the stitches of the repeated stitch pattern are made into chain spaces. I make two modifications – modify the base to my chain loop style and modify the edges so that no stitches have to be made in stitches. If you have any particular stitch patterns you’d like me to convert, I’d love suggestions. Let me correct myself! I just made a swatch of the pattern and I was wrong. NO sc in the last loop! Just do as the pattern states. You always want the same number of shells in each row, and the only way to do that is by making your last shell in what appears to the the next to last group. It all comes out even, and this is what produces the scalloped effect along the sides! Really clever. I have made one slight variation. I am chaining two instead of three before each 3dc group. It gives a tighter look, and I like that. THANK YOU, MAMA! Thanks! I have quite a bit of this yarn in a red/black color scheme and have been trying to decide what to use it for. This is perfect! I really like this pattern but cannot for the life of me get the start of it. I have done one of your other patterns with no troubles at all but this one i am just confused even with the picture tutorial. i get the first part of making but to continue making them is where im stuck as mine are not looking anything like yours. I need help getting started on first row. I can get first block and that is it. Can you post a video? Here is a video. Let me know if this doesn’t help. Thank you for the amazing tutorial!! I’ve started my blanket with Homespun Edwardian yarn and it looks amazing so far! You are my crochet hero! Please keep posting more fun patterns for bulky yarns!!! This version is great! I’ve been doing this starting with the chain. Then you have to go all the way around the last time to create the zigzag edge to the first end. This eliminates that step. Can’t wait to try this. Thanks!!! This is my second “No Beginning Chain’ afghan of yours I’ve attempted, and while it took me a couple of tries to get the pattern right, once I “got it” it’s a breeze and it looks wonderful in homespun yarn. Thank you, Thank you, Thank you! Can’t wait to give the No Beginning Chain ripple pattern a try. Excellent video tutorial (probably one of the best I’ve seen). I have wanted to do a scrap-ghan for a while, and this pattern is going to be great. I’m working on my first colour and have two rows done. I’m just using worsted weight yarn right now, but can’t wait to try in homespun! Thanks for sharing! so that I could work today, going to work on it more before bed tonight. Love this pattern!!!! Thank you so much for the pattern & video! Im new to crocheting but was able to make a beautiful throw to give my mother at Christmas. Your blog & instruction was just what I needed! Thank you Mama! I’ve looked for this pattern for years. I didn’t know the name of it so it’s been no easy task! My late Mother-in-law made an afghan for my husband when he was a teen. She had shown me the pattern about 30 yrs. ago. I made a baby afghan for a friend but didn’t use it again. Sadly I lost my Mother-in-law 20 yrs. ago and the pattern was lost to me. Then I found your patterns. I was so excited! My youngest daughter had asked me to make an afghan for a friend for Christmas. It came out so nice, I decided to make a queen sized bedspread for our bed. I just finished it and put it on our bed. It’s beautiful! Keep doing your great patterns, I love them all!! I like the pattern. I would like to knew if I could make bed spread like that. I do not knew how to knit. Absolutely. What size and what kind of yarn? I’m not the original poster, but I would love your help, please, with the same question. I intend to use homespun yarn for a Queen bed, so the measurements would be (correct me if I’m wrong?) a perfect square, at 60″ x 60″. I only want it to drape to the bottom of the mattress, not to the floor. Those sound like good measurements for that. Use a size K hook and start with 35 blocks in the foundation row. You will need around 1,700 yards of yarn. Is there a picture showing the complete sample shown? I am trying to get a sense of how much black you used and how much of the contrasting colours. Thanks. This was actually just a variegated yarn that worked out well. It came out to be about two rows per color. I love this pattern for normal, smooth yarn as well as knobbly yarns. It leaves such nice scalloped edges on the sides and bottom! I’ve loved the crazy shell stitch for a while, but the bottom edge being a straight chain always bothered me. Problem solved! Thank you very much! I absolutely LOVE this pattern! I just finished one blanket in no time at all and I just started a 2nd one for a Christmas present (yes, I will finish it before Christmas it’s that easy)! I just want to say thanks for posting this pattern and for including the video tutorials. Figuring out Row 1 is a little tricky but your video cleared it all up for me. I do not understand how you get the horizontal rows at the end of this pic. Are you joining blocks? I have crocheted over 60 years but can’t figure how this pattern looks like the pictured example. Do love the “No Beginning Chain” patterns. Like the others, I’m going to try some other patterns. Keep them coming! Thank you…. It’s how I have laid the blanket for the picture. I wanted to demonstrate that it was reversible and that the edges are all rippled. The other half of the picture, part of the blanket is laying over the other part going in the other direction. Another super tutorial.. My nephew wants another afghan and this is the pattern. He wants a tan, dark green and burgundy. Yikes. I am not very creative need your help. I am going to use homespun. But cannot figure the color scheme. Do you have any ideas on how to use these colors? Wish I could find a green variegated with burgundy lol. -alternate 8 row stripes of the two darkest colors with 4 row stripes of the lightest color. I LIKE THE PATTERN, AND HAVE READ THE COMMENTS. BUT, ROW 1 STATES,MAKE UNTIL DESIRED WIDTH,AND FOR A MEDIUM SIZED BLANKET 55.24″ 40 BLOCKS, HOW WIDE DO I MAKE THE BLOCKS. THINK THAT SHOULD BE INCLUDED IN THE INSTRUCTIONS FOR BLANKET SIZES. The blocks are the foundation blocks described in row 1. 40 of those makes a blanket 55.24″ wide. Each block is about an inch and 3/8. Thank you for this wonderful pattern. I’ve used it to make a mermaid afghan for a friends daughter. When she chose the homespun yarn I wasn’t sure about how to make it until I came across your site. I don’t understand the instruction stating ‘The best way to make a color change is to finish all but the very last pull through of the two loops of the last stitch of a row. Cut yarn with a few inches of tail and join with new color next to stitch. Pull new color through last two loops. Weave in ends.’ Can you post a video of this instruction being performed? I’m just getting back into crocheting so a visual would be easier for me to learn ‘how’ to change the color. I plan to make a 3 color afghan. Thank you so much I am excited to do this pattern as the beginning chain and double crochet stitch throughout is not working for me AT ALL so thank you for sharing your gift. I found this video which demonstrates how you want to change the color before completing the last stitch. This is because the last loop of a stitch is actually part of the next stitch. This is so cool! I too am part of a prayer shawl ministry at church and we have a variety of donated yarns, mostly Homespun and Boucle, which I really don’t care to use. This is a very creative way of starting a project and not needing to chain and then struggle to find the chain holes. I am a left handed knitter/crocheter and find this technique easy to use. I now have added this technique, as well as the ‘Foundation Chain stitch’ to my archive. (Another ‘no-chain’ technique but for sc.) Your tutorial was very clear and precise. Thanks for posting. I SOO enjoyed making my lapghan and would love to send you a picture. Thank you very much for sharing this pattern I cannot telk you how much I appreciate this pattern. I’d love to see a picture! You can send it to mama at thetucker dot com. what a neat way to start and avoid the long chain foundation! I would like to make a baby blanket with acrylic worsted weight yarn. My one concern is that the holes/spaces might be too large for a baby poking fingers. Is there a way to modify the pattern so that the holes are smaller? 2 SC vs 3 SC? 4 DC vs 3dc? or should i look at another stitch? For a blanket approximately 30″ wide, how many blocks do you think i would need? Thank you. I am glad i found your site! There really isn’t a way to modify this particular stitch to avoid the holes. I LOVE this stitch! Once you get going, it goes so smooth. I’ve made a blanket as well as a scarf with it. My question is I’m wanting to make a hat to go with the scarf. I don’t see hat version. Is there a stitch or pattern you have for crochet that might coordinate with this stitch? Thanks so much!! I only write knitted hat patterns, but I did some looking around for something that might coordinate with this stitch. I could only find a hat in a child size, but it might be modifiable. Im doing something wrong somewhere. My edges dont look the way they are supposed to. Send me a picture at mama at thetucker dot com. Maybe I can see what is going on. I love this stitch and pattern! I have made a blanket and a bed spread. Now I have a nephew that wants me to make a king size crocheted blanket. The size isn’t really a problem, but he wants his in a ripple type pattern and next to our holes. My question is this, is there a way to make this stitch / pattern into a Ripple pattern? I have pondered that many times since there isn’t anything I love more than a ripple blanket. I think the way the crazy stitch works would be somewhat lost in a ripple. I have this other ripple pattern that I think has a bit of a similar look to the crazy block. Hi! I absolutely love that the first comment on this afghan was in 2012 and you are still answering/posting comments!! I’m inspired by your patience and dedication to this afghan pattern! I purchased some yarn yesterday and am thinking I’ll use it for this pattern. The afghan will go to a women/children’s program. I love the look of this pattern. I have done a 5-block swatch (5 blocks over 10 rows) to get an idea of the pattern and wondered if I could add further 5-block squares directly onto each side, and keep adding patchwork-style in different colours, to make a blanket of multi-squares. Sorry if I’m not explaining myself properly. 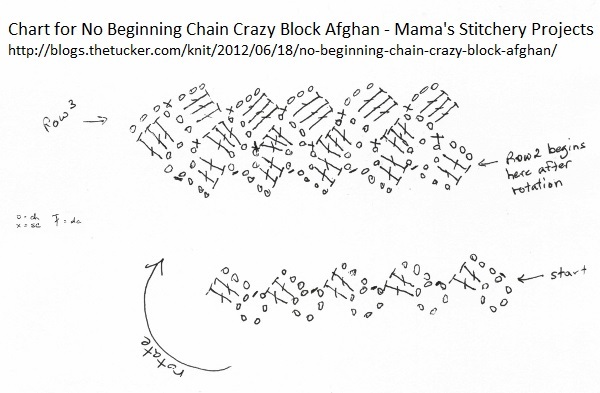 Have you tried this or is there a way that I could make many individual 5-block squares and join them together? I like the look of patchwork-style blankets and the individual squares make it easy to use up even small amounts of leftover yarns. Thank you for any assistance. By the way, I saw a post from much earlier where a lady added 3 dc instead of 2 in the beginning blocks and that is what I have done too. I think it makes those beginning blocks look much more even. Thanks again for sharing your pattern. Cheers from wintery Downunder, Sydney, Australia. I think this would work well for doing square patches. After the first one you could start subsequent ones in the loops of prior squares. On the sides you could do an extra sc into the other square to “join as you go”. in the no crochet chain method, what is done to figure out how many blocks to use in worsted weight yarn. In worsted it works out easily to one block per inch, so just make as many beginning blocks as inches of width you want.